If you have a shingle roof that’s more than a decade old, or a roof that has endured the brunt of a storm, then it may be time to replace your roof. But how can you be sure that your roof ought to be replaced? Well, there are some telltale signs that you can observe, indicating that your roof should be upgraded. And if you’re ever uncertain about your roof, we’re always a call away for an inspection. Here are the most common signs that your roof is on its last leg. Your shingles should run across the length of your roof in uniform lines. If you have any shingles that are out of place, then they’re no longer secured by the nails that should hold them. If you notice that you have loose shingles, often after a windy storm, then you’ll have to replace those shingles, or perhaps the whole roof (depending on the amount of shingles that are damaged and the age of the roof). If you notice loose shingles, it’s best to have your roof inspected and repaired as soon as possible. You may also be able to make a claim with your home insurer to get funds for the damage. Missing shingles are an obvious sign that your roof needs repair right away. If you can see missing shingles or the underlay membrane of your roof, then you’ll need repairs right away. Your roof underlay isn’t designed to handle storm conditions, since it’s your roof’s waterproofing layer that serves as a last defense against precipitation. 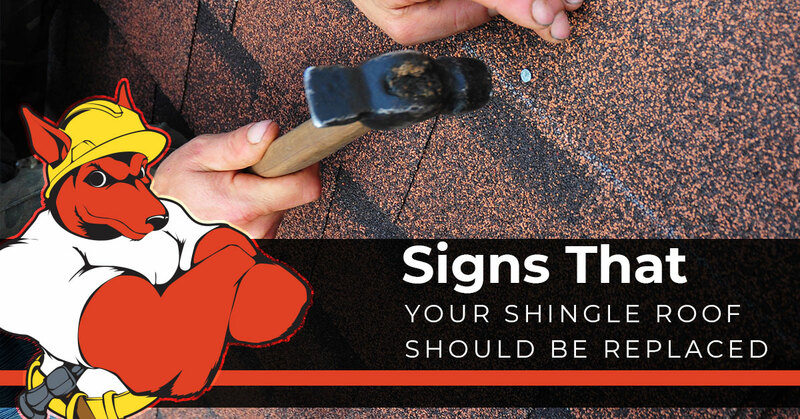 You should act right away if your roof is missing shingles. If you can observe exposed nails or nails that are jutting out from your roof, then your shingles are liable to come loose, tear, or fly off entirely. Be wary of exposed nails, and have your roof inspected if you notice any. Your asphalt shingles rely on granules as a first line of defense against precipitation. Rainfall runs over these granules and down into your gutters and downspout. However, over time your shingles will eventually lose their granules, and your gutters and downspout will accumulate granules. If you’ve notice that your shingles are discolored, and you can observe granules in the gutters around your home, then your shingles are losing their resilience in adverse weather. Leaks are an indication that your roof has failed entirely. You’ll have to have your roof inspected to assess the source of a leak. Be mindful that leaks can end up in your attic, the walls of your home, and ceilings throughout rooms of your home. Also, be wary that it may be difficult to ascertain the location of the source of the leak, since water can traverse across cross-beams and other interior structures in your home — so it’s best to have a professional roofer take a look. A sagging roof is another indication that your roof is leaking or damaged. Often, roofs sag if the wood structure of the roof endures water damage. You’ll have to have repairs performed on your home in order to install a new roof. Shingles only last for a certain period of time before their granules and material begin to fail. If your shingles are approaching 20 years of age or more, then they may be due to be changed. Have your roof inspected if you suspect that your shingles aren’t going to last much longer. If your roof requires new shingles, we’re the crew to call. We offer roof inspection and replacement services for folks throughout Sarasota, Bradenton, Lakewood, Parrish, Ellenton, North Port, Venice, and the surrounding area. Schedule an estimate for your roof today!